On a railing in the stands facing left field in Camden Yards, seven large medallions, six orange and one blue, sport seven numbers: 20, 5, 4, 22, 33, 8, and 42. Baseball fans know what those are: the retired numbers of the team’s most honored players. Orioles fans know who those are. I knew two when I was there earlier this month: number 8, Cal Ripken, and number 33, Eddie Murray. Cal was in his 10th season with the O’s when I moved in with Adam, shortly after which I began a pleasant habit of falling asleep to the sound of Jon Miller announcing games on WBAL. Please, somebody, if I’m ever in traction or trapped in a well, play me a recording of Miller calling a game—any game, any team. That’s the thing about me and baseball: I like the game—I like the sounds and the sights and the deliciously complicated rules—but I’m not a real fan. 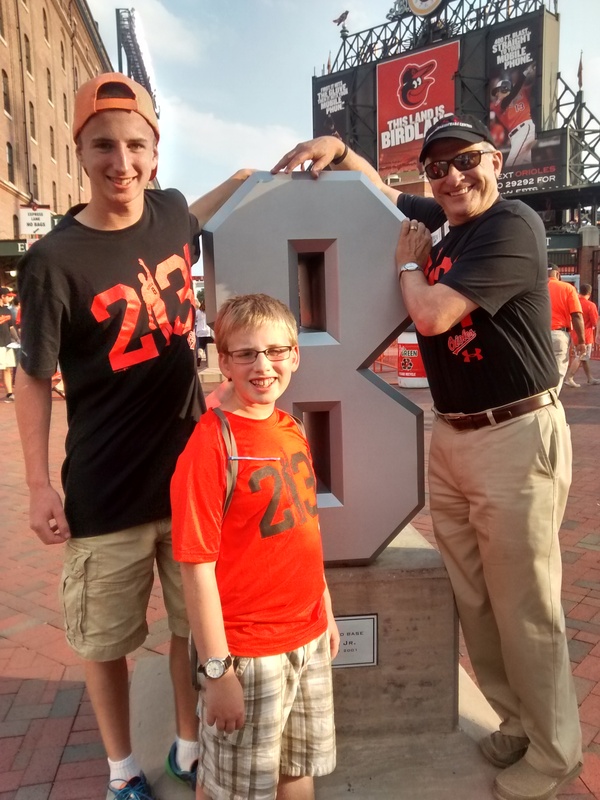 My attachment to the O’s is purely a function of my attachment to my husband—and now my kids—and my past. I’ve been with Adam since I was nineteen, which puts us somewhere in our 25th season. I am, in other words, a nonbeliever who married into the faith and allowed my kids to be raised as Orioles fans. Eddie Murray, number 33, had left the O’s when I met Adam, but I got to know him when he joined the Cleveland Indians, who were beloved by Adam’s best friend from childhood, who became my best friend, too, thus affording me ample opportunity to tease him about Chief Wahoo, the Indians’ mascot. Chief Wahoo takes the racism inherent in naming a baseball team after an entire dispossessed people and pushes it to 11. Wait: I actually knew three numbers: 8, 33, and 42. 42 is Jackie Robinson, the first African-American in the majors. He was never an Oriole, which is why his number is blue, not orange. But we can all agree on Jackie. Since 1997, the 50th anniversary of his historic start with the Brooklyn Dodgers, number 42 is universally retired. Seeing that number next to those of honored Orioles makes my throat go thick. What can I say? I am moved not so much by the saints themselves as by our reverence for them, and by what that says about our values and our beliefs. Yes, 20, 5, 4, 22, 33, 8, and 42 are saints of a kind, and this ballpark is a place of worship. I had just come from a bar mitzvah, where I attended not one but two sabbath services, so I could read the signs. At Camden Yards we gathered before the service in traditional garb outside the gates, where we paid homage to the statues of the local saints. We spoke to strangers as if they were friends, whether they were black or white, rich (club boxes) or poor (upper reserve). When we crossed the threshold into the ballpark, we left our mundane lives and entered a magical place where we were willing to pay $8.75 for a can of beer. Shortly after we took our seats among the congregation, deacons began moving up and down the rows passing the collection plate—“Coke! Coke! Get your ice cold Coke”—and those who were able, gave. 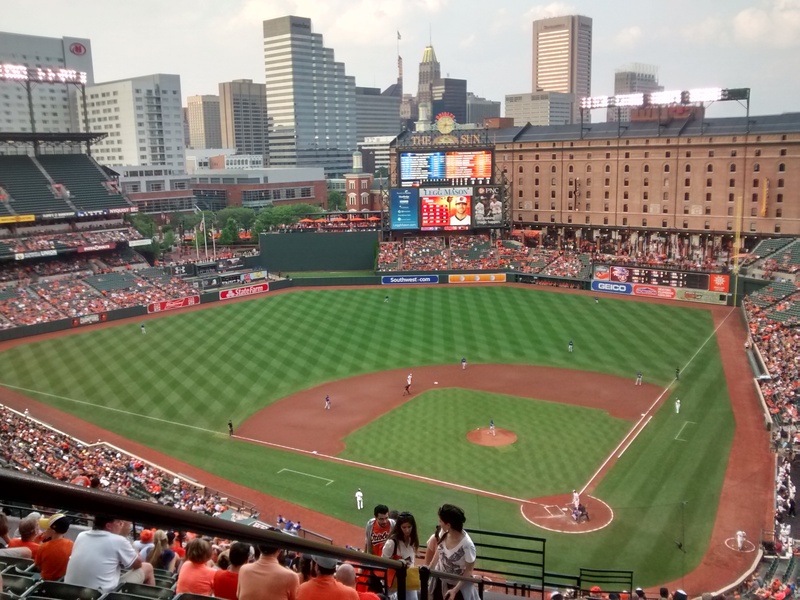 Although I own an Orioles t-shirt, make annual pilgrimages to Camden Yards, and know who Ripken and Murray are, I would never call myself an Orioles fan. But I sure acted like one. The jumbotron singsonged, “Everybody Clap Your Hands,” and I clapclapclapclapclapclapclapped as hard as anyone. It exhorted, “Let’s Go O’s” and I yelled along. A fan in the next section tried to start a wave at some point, and I did my best to keep it going—you can’t just throw your arms up, people, you have to stand, too! I stretched midway through the 7th inning, per tradition. For some reason, at Camden Yards, smack in the city of Baltimore, they play, “Thank God I’m a Country Boy,” during the 7th inning stretch, and—loving to dance, knowing the words—I sang along. It’s catchy. I was caught. A few days before, I similarly did not resist the various (Hebrew) equivalents of “Thank God I’m a Country Boy” at the bar mitzvah we attended—all the songs with familiar tunes and words I absolutely do not countenance that I sang with gusto because . . . singing is a pleasure. Remembering a tune from childhood is a pleasure. Filling up a half-empty synagogue with sound seems like the right thing to do, even if ritually and obsessively praising a primitive god seems very, very wrong. I call myself a Jew because that’s how I was raised; it’s not what I believe. But I have long maintained that attending church or synagogue is not the same as believing. People join in even when they have, doctrinally speaking, checked out. At the bar mitzvah, I was one of those people, wearing a tallis and chanting the prayers and bowing my head to read. When the Torah was lifted, I stood as instructed, in apparent homage to a scroll I considered to be about 13% thought-provoking, and otherwise tedious, archaic, and immoral. There may be some tedium and archaism at the ballpark, but there’s not much codified immorality. In fact, number 42 represents baseball’s pride in expunging such immorality, as does number 20, Frank Robinson, the first black manager in the majors (I looked it up). Maybe they’ll even get rid of Chief Wahoo one day. Mostly, though, baseball relegates such matters of import to left field. Mostly it’s just a game. Even the saints are beloved for things like playing 2632 consecutive games, for doggedness rather than dogmatism. Maybe that’s the real reason a non-fan like me can shout “Let’s Go O’s” at the top of her lungs and not feel funny about it. That essential frivolity frees me to enjoy—in the absence of belief—the sense of community and shared experience I seem to crave. That lots of us seem to crave. In the top of the ninth, with two outs, we were up 4 to 2. We all stood: those of us who could identify 20, 5, 4, 22, 33, 8, and 42, and those of us who couldn’t. We stood together, willing closer Zach Britton to seal the win. Strike 1, and a cheer goes up. Strike 2, another cheer. Ball 1, politely ignored, breath held. And then, in answer to our prayers, Strike 3.